California is no more. The state, last I checked, is still there, hugging the Pacific Ocean, but the dream of California—of sunshine, of fresh opportunity, of unbounded freedom—has withered. It has been perhaps irreparably shrunken by decades of poor financial planning, bad politics, and a maddening electorate demanding more while offering ever less. Pity the poor soul, then, who must serve as California’s bard. Faced with its seemingly irreversible decline into mediocrity, political gridlock, and the collapse of the state’s once-magnificent public institutions, what is left for Kevin Starr—onetime California state librarian, and author of the brilliant seven-volume history of the state, Americans and the California Dream—to celebrate? The most recent volume of Starr’s history was Golden Dreams: California in an Age of Abundance 1950-1963, which appeared last year and documented the state’s steady upward climb—from Spanish outpost, through steady growth, and then to an era of wealth, prosperity, and national influence. Titans—Earl Warren, Pat Brown, Clark Kerr—walked the earth in Golden Dreams, and California was, many believed, the model for the American future. Today, the prospect of the rest of America taking its lead from California is very dim indeed. The author’s style—multi-disciplinary, astoundingly varied, and more than a little romantic, although entirely honest about the state's failings and the lies it has told itself—requires some translation for his new book, a similar though far more compressed narrative. Starr has taken a pause from his life’s work and put out a brief study of one of the state’s most beloved monuments. It is a lively monograph about the planning, funding, construction, and aura surrounding the Bay Area’s Golden Gate Bridge. But concentrating intensely on just one subject, Starr’s characteristic blend of lyricism and historical narrative seems overwrought, as comparisons to the Parthenon sit uncomfortably next to detailed engineering reports. Starr begins, once again, with a dream. This time it is the dream of linking the bustling but territorially limited city of San Francisco with the vast headlands of Marin County. Planning for the bridge had begun as early as the 1850s—three decades before the completion of the Brooklyn Bridge—and reached a fevered pitch by the 1920s. San Franciscans looked south and saw Los Angeles, a city capable of sprawling across hundreds of square miles, while they remained hemmed in on a forty-six square-mile peninsula. The bridge-builder Joseph Strauss, aided by a city engineer named Michael O’Shaugnessy and a team of consultants that included Leon Moisseiff (the designer of the Manhattan Bridge) and Othmar Herrmann Ammann (designer of the George Washington Bridge), came up with a plan for an enormous bridge that would span 4,200 feet between its towers—the longest single-span suspension bridge in the world. Eighty thousand miles of wire were unspooled and spliced across 7,650 feet between the bridge’s anchorages, capable of supporting four hundred million pounds. An enormous concrete fender, the length of a football field, was reclaimed from the ocean, drained of water, and filled with a concrete-and-steel framework for the south pier of the bridge. The plans for the bridge even included increased protections for its workers; and by the end of construction, there were nineteen members of the Halfway to Hell Club, composed of men who had fallen off the bridge and been caught by the safety net specially constructed (at a cost of $130,000) for that purpose. The bridge took just over four years to complete, opening to the public on May 27, 1937. Over two hundred thousand people walked across the bridge that first day, including numerous attention-seekers hoping to claim a first for themselves: “the first twins, the first man on stilts, the first person to walk across backward, the first to roller-skate, the first to tap-dance across, the first to cross barefoot.” Golden Gate culminates with the bridge’s completion. Starr pads the book with reports on the bizarre items drivers left as collateral at bridge toll booths (canes, fur coats, false teeth), and the Golden Gate’s presence in films ranging from Guess Who’s Coming to Dinner to Mrs. Doubtfire, but this all feels extraneous, a melodramatic but trivial and altogether superfluous appendage to the heart of the matter. The Golden Gate Bridge still stands, shepherding cars and bicycles and pedestrians into San Francisco, but the dream that once built it and so many other wonders lies in shambles. 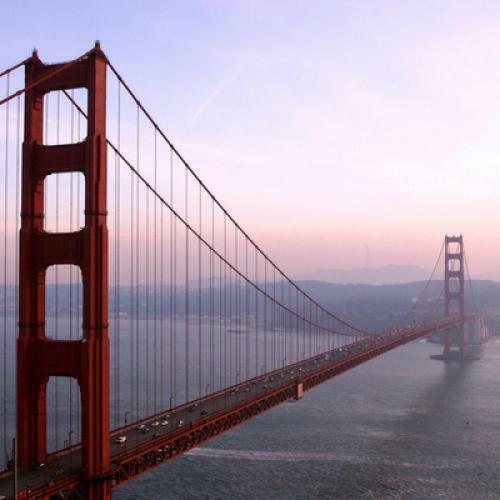 The state’s fiscal troubles, and its political gridlock, practically ensure that there will be no more works of practical art like the Golden Gate Bridge in the foreseeable future. Without the California Dream, can there be a California? Kevin Starr is a romantic in a decidedly unromantic moment, an idealist in an era with little to idealize. Is his work a balm, or only an incitement to further pain? I suppose that depends on how deep your own romance with the Golden State extends. In comparison with his heftier tomes, Golden Gate is a minor effort, but even if its narrative is ultimately less than fully satisfying, its aching romanticism is a necessary salve for a once-golden state in a world of pain. Saul Austerlitz’s new book, Another Fine Mess: A History of American Film Comedy, will be published in September by Chicago Review Press.